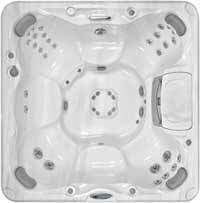 The 780™ Series outdoor hot tubs hit the sweet spot between entertainment center and meditative garden retreat. Designed with natural colors and clean styling, these easy-to-maintain outdoor spas can form the basis of a no-hassle lifestyle. 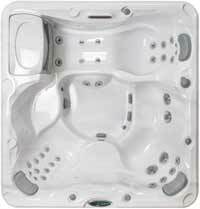 Each one is built in the best Sundance tradition of reliability and high performance, so all you have to do is relax, host a party, or let the jets work on those sore muscles and joints. -AquaSheer water feature is designed with a curved edge for a sheer "curtain" of water. 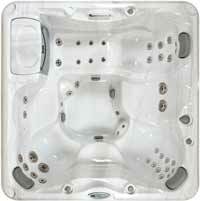 -LED in-spa illumination includes light rings on air controls (on select models). -Colors can be set to one shade or rotating. -Improved footwell lighting enhances glow from within the spa's water. -iTouch control panel provides easy access for adjusting the lights in the waterfall and footwell. Protect your investment with a marine-grade, high-density foam hot tub cover. 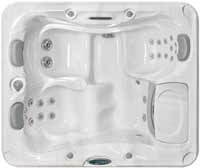 Making sure your hot tub is covered helps lower the cost of heating the water and gives you the peace of mind of knowing that your hot tub is safe and secure during inclement weather. 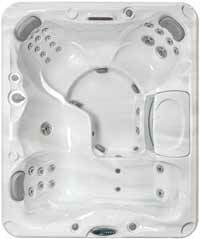 Hot tub covers also prevent leaves and blowing dust from getting into the hot tub water, which means it stays clean longer. That reduces the time and cost spent to maintain your spa.